For the Mozilla Foundation employee, see Gervase Markham (programmer). Gervase (or Jervis) Markham (ca. 1568 – 3 February 1637) was an English poet and writer, best known for his work The English Huswife, Containing the Inward and Outward Virtues Which Ought to Be in a Complete Woman first published in London in 1615. Markham was the third son of Sir Robert Markham of Cotham, Nottinghamshire, and was probably born in 1568. He was a soldier of fortune in the Low Countries, and later was a captain under the Earl of Essex's command in Ireland. He was acquainted with Latin and several modern languages, and had an exhaustive practical acquaintance with the arts of forestry and agriculture. He was a noted horse-breeder, and is said to have imported the first Arabian horse. Very little is known of the events of his life. 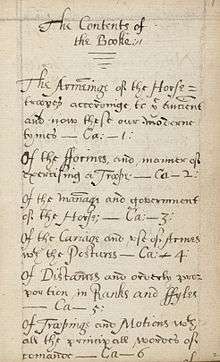 The story of the murderous quarrel between Gervase Markham and Sir John Holles related in the Biographia (s.v. Holles) has been generally connected with him, but in the Dictionary of National Biography, Sir Clements R. Markham, a descendant from the same family, refers it to another contemporary of the same name, whose monument is still to be seen in Laneham church. Gervase Markham was buried at St Giles's, Cripplegate, London, on 3 February 1637. Markham edited the Book of Saint Albans sometimes attributed to Juliana Berners, under the title of The Gentleman's Academy (1595); and produced numerous books on husbandry, many of which are catalogued in William Thomas Lowndes's Bibliographer's Manual (Bohn's ed., 1857–1864). Michael R. Best (editor), The English Housewife, Toronto: McGill-Queen's University Press, 1986. ISBN 0-7735-0582-2. Frederick Noel Lawrence Poynter, A Bibliography of Gervase Markham, 1568?-1637, Oxford: Oxford Bibliographical Society, 1962. 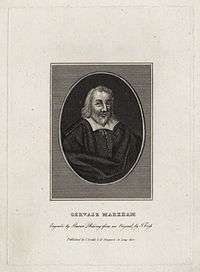 Wikimedia Commons has media related to Gervase Markham.